The election of a new patriarch is dividing dignitaries of Turkey's Armenian community and the patriarchate. Incumbent Patriarch Mesrob II of the Patriarchate of Turkish Armenians has been in a vegetative state since 2008 after he was diagnosed with dementia. Archbishop Aram Ateşyan is the acting head of the patriarchate but the community has repeatedly called for the election of a new patriarch. Ateşyan had reportedly pledged that an election would be held last year, though the council of bishops failed to reach a consensus on an election. Bedros Şirinoğlu, president of the Yedikule Surp Pırgiç Hospital Foundation, which represents the Armenian community, has called for a fair election. "It is time to hold an election. You cannot have an acting head of the patriarchate for seven years," he said. Garo Paylan, the administrator of the Yeşilköy Armenian School and a prominent figure in the Armenian community, said Mesrob II has an incurable disease, and having an unelected figure leading the church for a long period is wrong. Angered by the call for an election, Ateşyan said people calling for the election merely represent foundations and that the decision on the matter rests with the patriarchate. Dr. Ardaş Akdağ, chief physician of the hospital where Mesrob II is confined to said there was no sign of improvement in the patriarch's condition. "A patient in his condition wouldn't survive, but he has clung to life. Nevertheless, the probability of a recovery from a vegetative state is almost zero," he said. 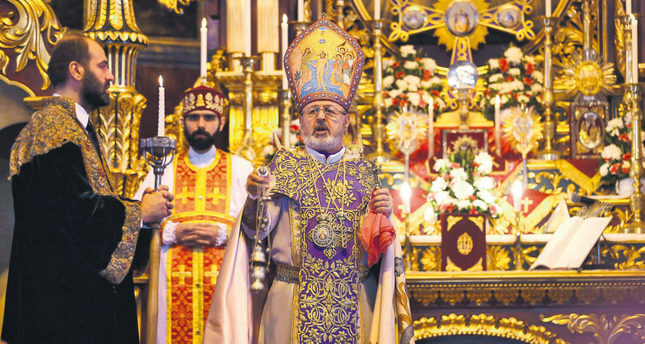 Mesrob II, 59, is the 84th patriarch of Turkey's Armenian Orthodox community who succeeded Karekin II in 1998. Turkish law bans the election of a new patriarch while his predecessor is alive. A patriarchal election is required to be held by the synod, and the synod has to apply to the Interior Ministry after approving the election. The government ruled out an election of a new patriarch but a group of Armenians filed a lawsuit for the removal of regulations blocking the election. The legal process is still underway. Another debate is over whether the new patriarch will be a "co-patriarch" or not. According to reports in the media, members of the synod advocate for the election of a co-patriarch instead of a new patriarch while Mesrob II is still alive. In 2010, a group of Armenians had filed a petition to the Interior Ministry to allow the election of the patriarch by the vote of the congregation rather than the synod. Agos daily reported that the synod, which convened last month, discussed the election but the majority opposed it - though Agos quoted sources claiming the clerics faced pressure from Ateşyan to vote nay. The Armenian patriarchate was established in Istanbul after the city's conquest by the Ottoman Empire and oversees Armenian churches throughout the country.